So, I have problems with Trader Joe’s. Problems like… I am positively obsessed with it, mainly. Like, for awhile there, I would show up every Friday basically begging the managers for a job. I wanted to work there SO.BAD. Still do! But my store never hires. Sigh. And also, I would show up and just meander through the aisles looking at all the yummy-sounding, health foods and suddenly want to eat tofu nuggets because Trader Joe’s makes them look good. Oh, and the fact that I’ve purchased EVERYTHING they’ve demoed says something. Turkey corndogs? Check. Red pepper jelly? In my basket like, .3763874 seconds ago. Lemongrass chicken stix? HOLY HELL–who knew grass could taste SO GOOD?! Anyway, there’s one problem I have with TJ’s. Well, actually, two. One is that, since I moved, they’re further away which is totes lame and needs to be fixed immediately (you hear that?! Your first employee is right here!) and two, is the TJ’s shoppers. If the shoppers could be like the workers, it’d be the best store in all the land, narrowly beating out Forever 21 (which if you know me, is saying a lot). Seriously, navigating the TJ’s store requires the utmost skill which, sadly, no one but myself possesses. In fact, a few days ago I showed up, barely making it out of the parking lot alive, and entered the wooosh of their automatic doors. And in that instant: I was in the Hunger Games. You see, TJ’s makes cookie butter, their version of the ever-popular Biscoff spread. Because Biscoff is expensive at my local grocery store and I can’t very well tell my mom that I spent our weekly dinner budget on cookie spread, I show up to TJ’s to get the stuff cheaper. Plus, then I can get free samples of stuff and witness the weird phenomenon when you go to Trader Joe’s stores and stuff like, jumps into your cart. Has that ever happened to you? It’s so weird. I’ll be walking around, minding my own business when all of a sudden, a container of lemon turnovers just like, pops into my cart! 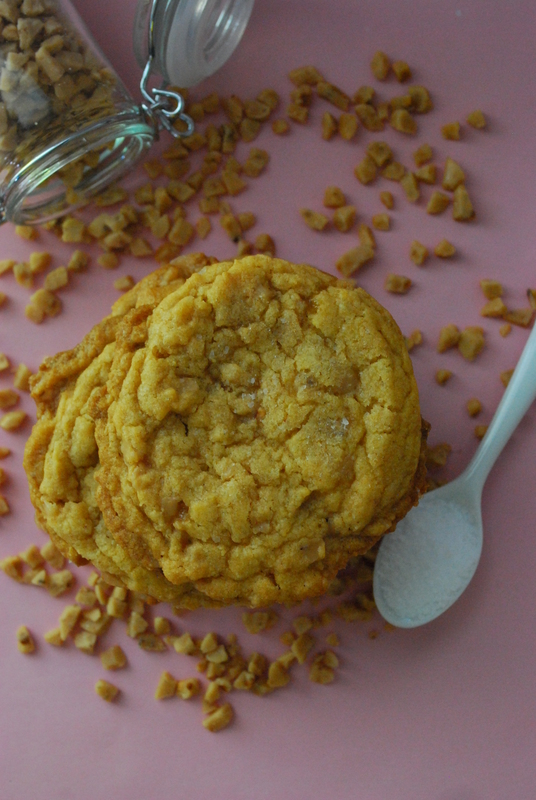 And whoa, here comes some toasted coconut cookies! And I ducked just in time before the box of mac and cheese balls landed next to the jumping fleur de sel caramel sauce. So weird. Like Twilight-Zone status, people. Just so you know, things at Nordstrom Rack and Sur La Table do that, too. Anywho, this time, per the norm, I had to weave my way through ignorant folks basically twiddling their thumbs in their belly buttons, not thinking about a care in their empty heads. Saying “excuse me” does nothing for my mobility since none of them bother to listen to acknowledge me and instead, decide to continue to be a road-blocker while the breeze flies in one ear and out the other. So I have to really know what I want and have like, a blue print-type game plan before I even enter, because if I even attempted to do full-on grocery shopping there, well, we’d have a serious problem. Okay, I wouldn’t have a serious problem–the slowpokes would. And it would include flax seed in a not-so-nice way you wouldn’t expect. But anyway, I got out unscathed and with cookie butter in hand. Also mini tamales. And pomegranate limeade. And uh, maybe some guacamole. Whatever. And I came home and took my stresses out on something really yummy… and something that doesn’t include flax seeds. 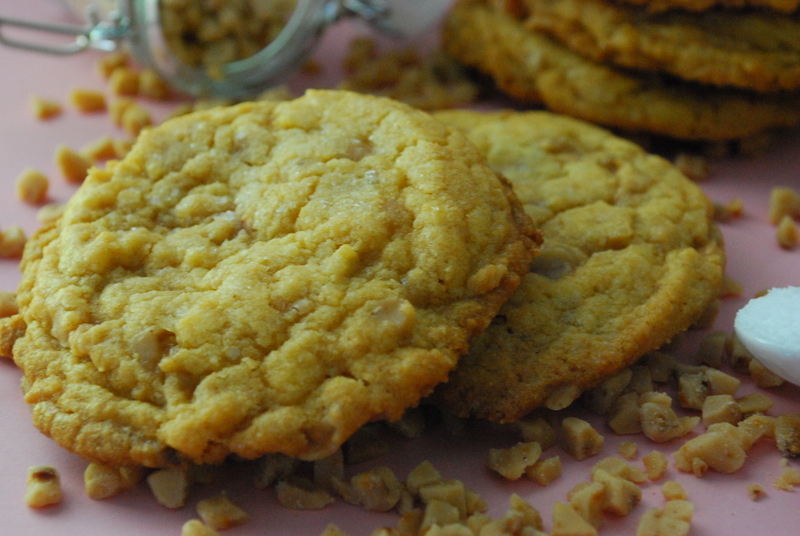 They’re Biscoff Toffee Cookies and really, they’re super easy. I should make another couple batches to lure the lame-os out of the store so I could have it all to myself… but I’m afraid you’ll never hear from me again as I’ll be known as Hayley, Joe’s Groupie and I’ll live in the back and they’ll feed me scraps of demo food and expired granola and I’ll weigh five-hundred pounds and wear a lei around my neck. 1. Preheat oven to 350 degrees F. Line 2 baking sheets with Silipat liners or spray lightly with cooking spray, blotting the excess spray with a paper towel. Set aside. 2. In a large bowl, mix together the cake mix, eggs and oil with a wooden spoon until blended. Stir in the cookie butter spread and toffee chips to combine. 3. 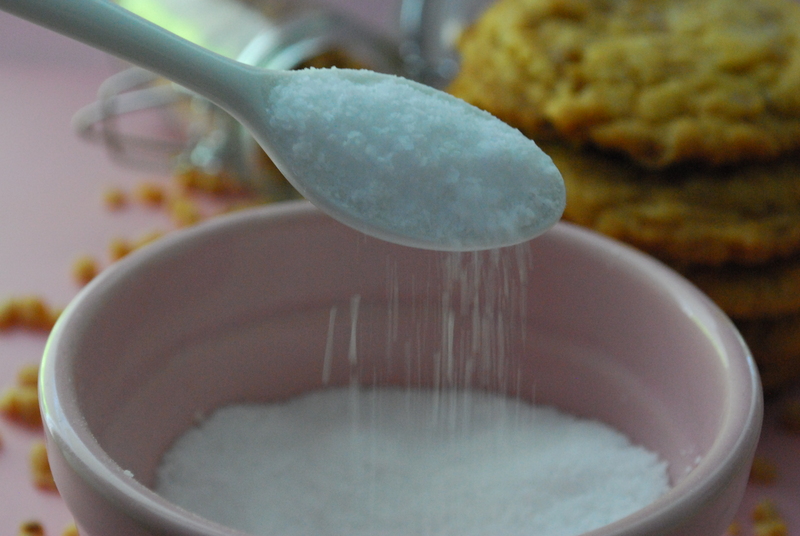 Drop heaping Tablespoonfuls of dough onto the prepared cookie sheets, about 2″ apart, and sprinkle lightly with sea salt. 4. Bake for approx. 10-12 minutes, rotating baking pans halfway through cooktime to ensure even baking. Allow them to sit on the cookie sheets for about 5 minutes before transferring to wire racks to finish cooling completely. 5. Store cooled cookies in an airtight container 2-3 days. 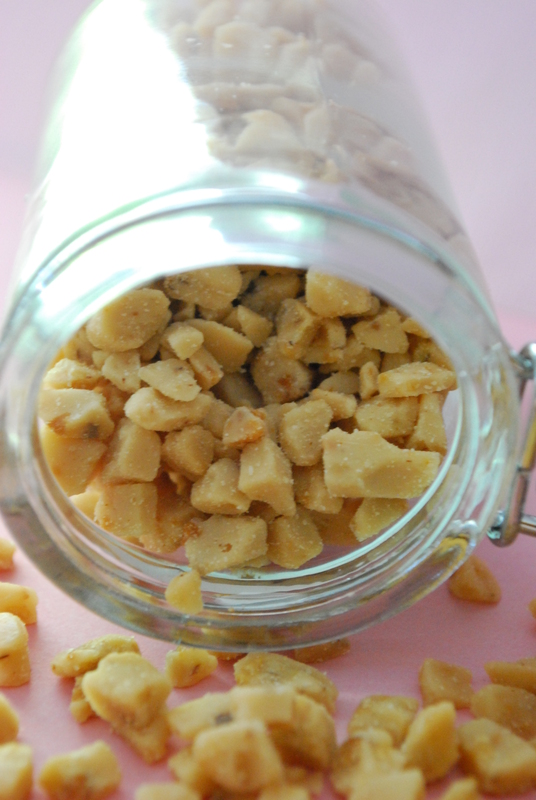 I love the contrast between the sea salt and the cookie butter and toffee–the mixture is so unbelievably good! And if you haven’t tried Biscoff/cookie butter yet, I am convinced you live in the back of a cave somewhere eating stale granola and MUST come to civilization to get some. It’s seriously life-changing. I mean, don’t make these cookies and just eat it with a spoon–it’s that good. LOL, gotta love how things just ‘happen’ to fall in your cart! I haven’t tried this cookie butter yet (don’t think we have it in Canada yet but probably soon), but it does sound yummy! What does it actually taste like?? Ikhlas, it tastes like gingerbread cookies ground up into a peanut-butter-like consistency. It’s SO good. I hope you get some, soon! Guess what I don’t have in my city? Yep, that’s right–a Trader Joe’s. The closest one to me is 3 hours away. Cue sad crying here. PLUS, my stores here only recently started carrying Biscoff! I finally got some the instant I saw it–just about 3 weeks ago–and ohmygosh now I see what everyone’s been raving about! I’ve been trying to decide what baked goods to use it in first–these cookies look AWESOME! Oh. My. God. I love these! And I totally get this entire post. Why else would I have three jars of hot fudge and caramel sauce in my pantry? They need to put a store closer to us!!! I know! That, and I never take inventory of stuff before I buy it (sorry, Mom!) so I have like a zillion bags of marshmallows because I’ll get to the store and have a sudden, paralyzing fear that I don’t have ANY marshmallows at home and therefore could NEVER make my dream-come-true bar/cookie/cupcake/confection without them. Sadly I have never been in a Trader Joe’s…this must be remedied. The closest one is about an hour away. 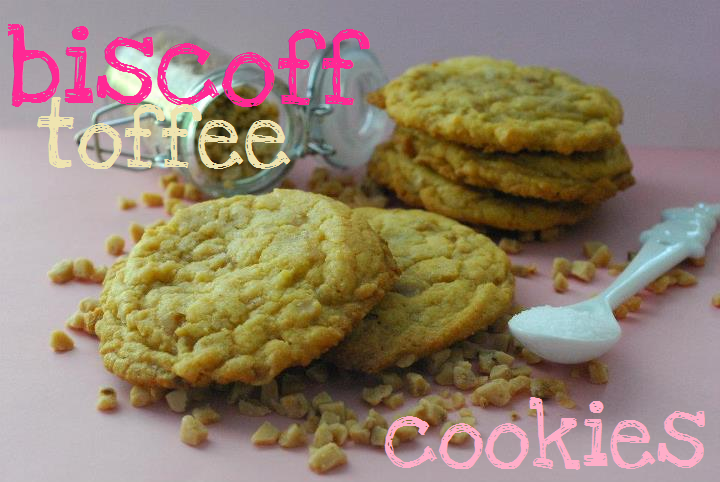 So now I really need to get there so I can stock up on things and have 5 jars of caramel and fudge and cookie butter:-) Biscoff is amazing and I love that you used it in these easy cookies!!! Do not, under any circumstances, eat T Joes pretzel bread. It’s amazing (awful) & I have (not) driven all the way over there just for (terrible) pretzel bread ! Whoa, waiiiiiiit now–PRETZEL BREAD?! OMG HOW DID I NOT KNOW ABOUT THAT?! I need some… now. I mean, I may or may not be making a completely out-of-the-way trip for some… now. ….and there she goes, Trader Joes next victim. We’ll all remember her fondly…..